Check the Tata AIA Online Payment process. Customers of Tata Life Insurance can check the complete steps of premium payment through online. By using these steps, you can also renew or buy a new Tata AIA Policy through online. So go through the following steps for detailed information. In these busy lives, nobody has time to visit the Tata AIA branches to pay Premium for the products they have bought. To save the Customers time, the Tata AIA Life Insurance Company has implemented this Tata Online Payment option. Using this Online Payment service the policyholders can pay their premiums where ever & when ever they want. Even though they can buy the products through Online. This Online Payment facility applies to every Tata AIA Life Insurance Policy. So the customers of Tata AIA Insurance can Check the Online Payment service & Buy Online Process on this page. The Online Payment Gateway gives you with an on-demand service within a few clicks. You can also visit the Tata AIA Branch Office to buy or pay the premium. The Policyholder can get the payment instructions at their comfort zone like home or office, and avoid the personal visit to the branch office. In this article, we have provided the procedure on How to make Tata AIA Online Premium Payment in simple steps. We wish after going through this page; you may feel online is the easy way to pay the premiums. The Tata AIA Life Insurance Company has provided multiple options for Online Payment. There are two ways in which the policyholder can make Tata AIA Online Payment. Let us have a look at each and every Online Payment method in a clear way. The Customer can make Premium Payment through Login Account/ Pay Premium Option. While Buying the Product through Online, you can make Payment. Most of all the Customers are nowadays requesting the companies to provide the Online Services. By considering these suggestions, the Tata AIA life Insurance Company has modernized. Now, you can visit the Official Website just with the Internet Facility. Use the latest Tata AIA Online Payment Process to save the time. 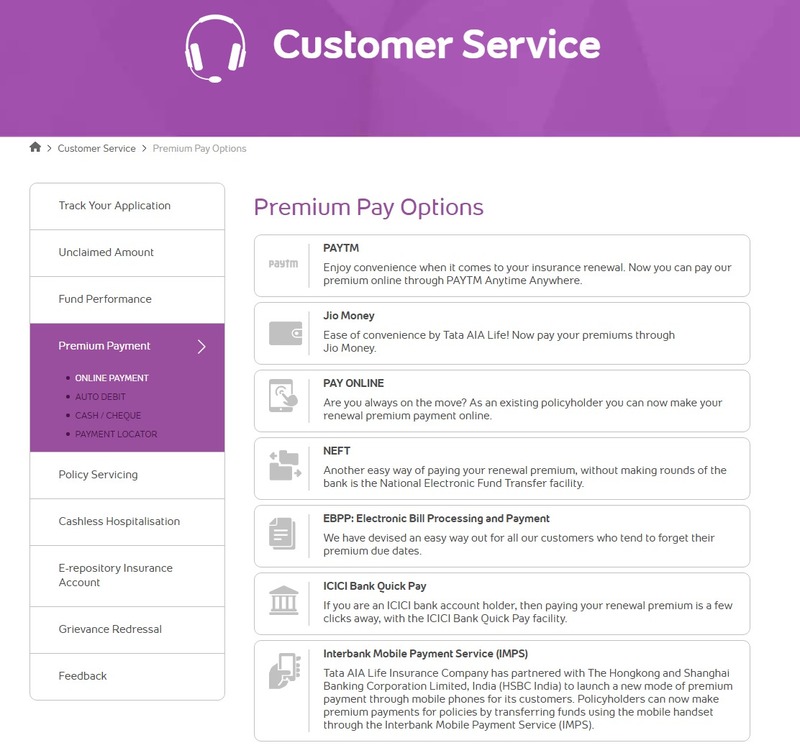 At the right side of the page, you will find Pay your premium option as shown below. Click on Pay your premium option. Once you click on the option, you will redirect to a new webpage. At the left side of this page, you will find Pay premium option. In the Payment section, you can pay the premium using Paytm, Pay Online, ICICI Bank Quick Pay, NEFT, Jio Money, EBPP, and IMPS. Depending on your requirement you can pay your premium and renew your policy. There are four ways to make payment using Pay your Premium. 1. Online Payment: The Insured can pay the premium using one of the following options. 2. Cash/ Cheque: The listed branches where you pay the premium amount are given below. 4. Payment Locator: Under this option, you have to enter the Pincode to know your nearest premium collection centers. Customers who have registered can also make the premium payment through the login. For those customers, we have provided complete steps for paying the premium. Now you will redirect to a new webpage which contains Customer Login details. Fill the mandatory details and click Submit. Now you can pay the premium using your login details. The Tata AIA Policyholder will redirect to a new webpage. 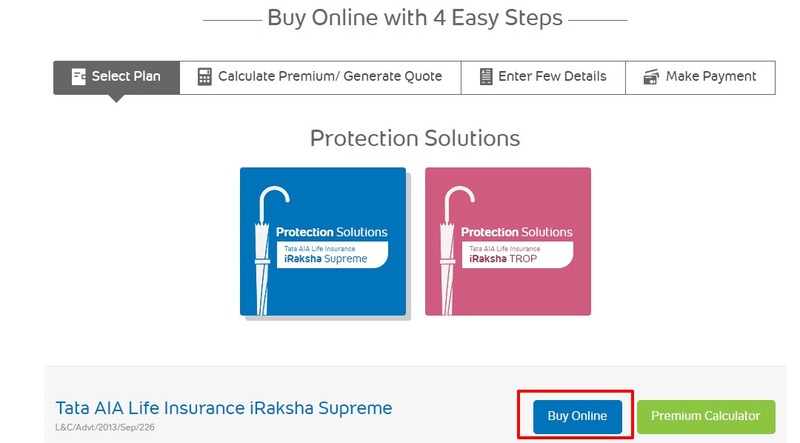 In that Select Tata AIA iRaksha Supreme or iRaksha Trop and click on Buy Online option. Now you will get four options. Fill the details and make the payment. At the final Step, you can pay the premium for your needed policy. So follow these steps and buy and renew your policy through Tata AIA Online Payment process.